As I sat down to write this post, I was reminded of last year’s &THEN weather forecast. All registered attendees were anxiously watching a storm named Nate and airline travel advisories to determine if they would be able to get to New Orleans. Hurricanes aren’t in the forecast for this year’s &THEN location, Las Vegas, unless someone has a craving for Creole or Cajun while there. Instead, this year’s conference will have attendees talking about ANA’s acquisition of DMA earlier this year and looking to learn about what that means for the future of DMA and &THEN. The &THEN website promises an “unprecedented speaker lineup.” This includes keynote speaker Bozoma “Boz” Saint John, whose previous role as Head of Global Consumer Marketing for Apple Music and iTunes made her a household name for music fans. Buzzfeed called her “the coolest person to ever go onstage at an Apple event,” so I’m certain the room will be filled for her keynote address on Monday morning. While it may not be generating as much buzz as Boz, I’m proud and excited to be an executive member of DMA’s new Council for Print in the Digital Age. After members (including IWCO Direct) asked why DMA seemed to be almost ignoring print’s role in integrated marketing in recent years, the DMA Board proved they were listening by launching the Print in the Digital Age Council. Based on the number of attendees for the Print Council’s first webinar in June, DMA’s wager seemed like a solid bet for Las Vegas and beyond. As you’ll see in the schedule, the Council is sponsoring a breakfast in Room 102 before Boz’s keynote to help get attendees energized and excited about the new “Print Innovation, Digital Integration” track. 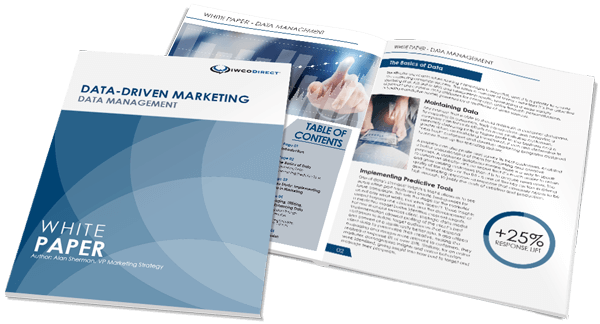 The track promises to provide content that will accelerate your marketing impact with proven strategies to reach customers via innovative print materials that should be a key part of your omnichannel marketing strategy. There are eight great sessions in the Print Innovation, Digital Integration track. I’m excited to be leading a panel discussion on Monday afternoon at 2:25 p.m. on “The Holy Grail of Marketing.” Holy Grail is a classic Monty Python movie and also describes something you want very much but is very hard to get or achieve. The panel chose the title because measuring the impact of the integration of online/offline marketing seems to be the holy grail for today’s marketers. I’ll be joined on the panel by Jon Affatato from American Express, Pam Farrell from AARP, and Jakob Rasmussen from Comcast, all of whom will be sharing their ideas and advice about how using direct mail and digital marketing together drives higher response across all channels. As I’ve come to learn, these panelists represent three very different business models, lines of business, and objectives, but share a common passion for testing, learning, and sharing ideas and ideals. Other sessions in the Print Innovation, Digital Integration track have shorter titles, but I know they will be as compelling as the Holy Grail session because of the knowledge, experience, sense of humor, and expertise of the speakers (yes, John Sisson, even you!). Wishing everyone safe and smooth travel to Las Vegas. I’ll look forward to pouring a cup of coffee for you at breakfast on Monday morning and then heading over to see Boz get the room rocking (a whole different kind of hurricane! ).